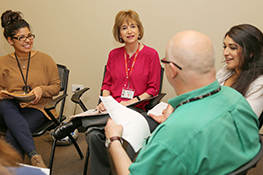 "Investing in All of Our Futures"
AMITA Health Alexian Brothers Center for Mental Health Outpatient Counseling Team Leader Barb Howard says investing in mental health is an investment in all of our futures. 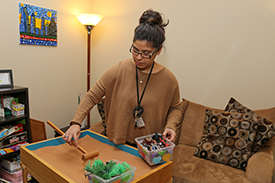 Thanks to the investment of donors like you, the Center for Mental Health is entering its 54th year of providing mental health services to the community. This is in spite of $652,000 in state funding cuts this year. 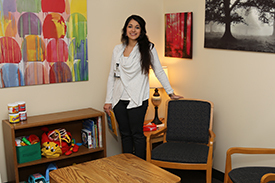 You helped ensure that 900 people could access psychiatric services they wouldn't otherwise have received. You made it possible for therapists like Barb, Sarah, Gary and Natacha to do work they love: giving thousands of community members, including thousands in 21 area schools, tools and skills to lead healthier, happier lives. Thank you! As you read more below about Barb and our therapists, please know that your investment is making a difference. By helping people who need these critical services, you are creating better schools, safer streets and stronger families. Thank you for your support. Please consider making a gift to the Center today to help us continue to meet the increasing need for services, or join us Monday, June 6 for our Chip In Golf Outing. Proceeds benefit the Center for Mental Health. Thank you! "This work has taught me how many people need our help." "You're investing in all of our lives and all of our futures." "It makes a difference, working for a faith-based organization." "Treatment really does make a difference." 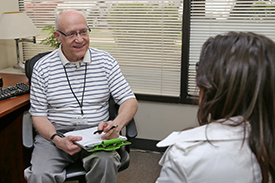 Learn more about the work we are doing to expand access to behavioral healthcare. Make a gift to support people struggling with mental illness or behavioral health disorders.